Looking for inspiration to add a modern edge to your inner-city apartment? Then looking no further than this artistic abode, that has been uniquely decorated using an array of bright colours, mirror and graphics to create a home brimming in pop art style. The product of Russia’s Apriori Design, the home has been constructed within a small 67m2 floor plan, but packs plenty of personality! From the get-go the décor reveals a range of striking design features, from the fluoro green sofa in the living room to the feature wall decorated with a black and white graphic of San Francisco's Golden Gate bridge. Floor to ceiling panels of mirror are also used in the living room to provide a sense of visual expansion, while a compact area for cooking and dining sits close by, exuding a sleek, modern air through the use of shining white and gunmetal finishes. The bathroom and bedroom within the apartment present a striking aesthetic shift, with the darker décor of the living, kitchen and dining spaces having been abandoned in favour of well-lit rooms of shimmering blue. 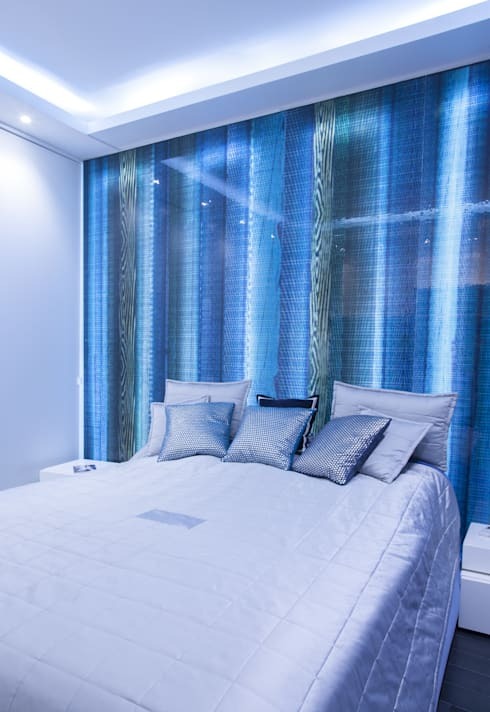 The bedroom houses one of the home’s most inventive decorative treats, with the space featuring a one-of-a-kind glass mosaic wall, backlit with LED lighting, which casts a glow upon the room. This apartment is truly one of a kind, and showcases a wonderful example of a designer taking inspiration from a strong, artistic theme and creating something unique and surprising. 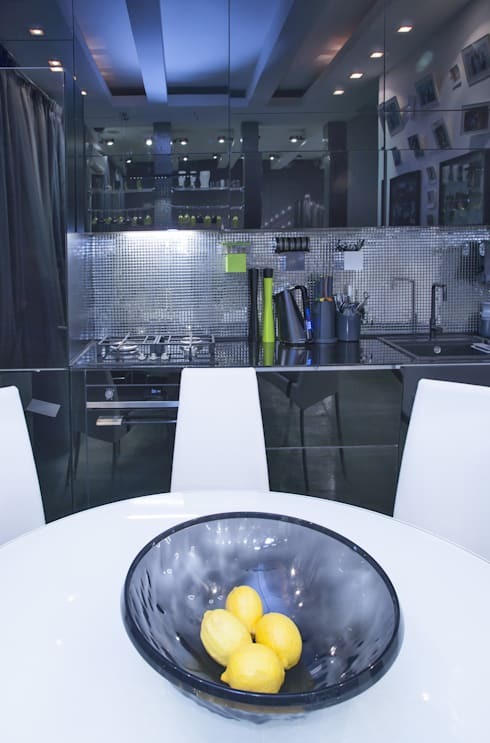 Upon entry its evident that the interior design of this home has been conceived by a bold decorator, with the unique combination of fluoro green, gunmetal grey and black predominating within the space. The extraordinarily bright colour of the sofa is necessarily offset by the darker tones of its surrounds, while the Golden Gate graphic in the distance ties in beautifully with the spotlighting illuminating the room. Also featured in the living room are floor-to-ceiling mirrored panels, which create a series of hidden doors housing storage space. The mirrors were designed to create a sense of visual expansion, as demonstrated by the manner in which they beautifully draw out the length of the graphic feature wall, with the Golden Gate seeming to flow in its entirety across the room. As we move through to the apartment’s kitchen and dining space it becomes apartment that the designers have sought to have as much fun as possible with the mirrored panels. This contemporary clock and moon chair have been strategically placed to look like a quirky face, staring at us from the corner of the room! Although compact in design, this kitchen gleams with a sophisticated, modern air, with its gunmetal finish shining beneath the bright lights overhead. All the necessary mod cons have been included, with plenty of storage built in to maintain the kitchen's streamlined aesthetic. Also in this area is a small, round dining table with matching white chairs; perfect to host a cosy dinner party in an apartment of humble size. Moving through the to bathroom and we’re met with a clear change of aesthetic pace, as the gunmetal greys and blacks of the living room and kitchen are replaced by a palette of cool blue. Finished with a range of textured tiles, the blue décor in this room emits an almost watery effect, while a black sink unit and dark flooring ground the space with their deeper tones. A large mirror has also been included here, adding a sense of visual expanse within the compact space, while overhead lighting allows those blue tiles to truly shimmer. 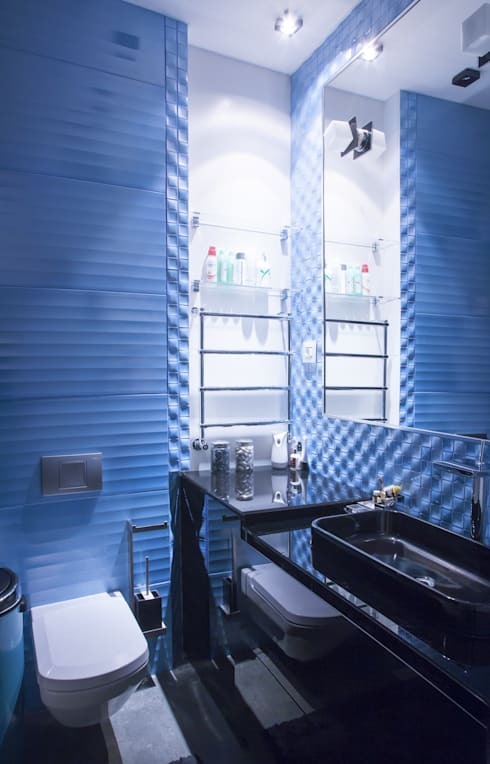 The bedroom in this unique apartment has been decorated in a similar cool blue as that seen in the bathroom, with this brilliantly patterned mosaic wall definitely drawing focus within the space. The mosaic is made from small, coloured panels pasted onto acrylic glass, and is back lit with LED strips, thereby emitting a striking, blue glow. The blue glow casts a a serene air about the room, while the patterns of the mosaic present an intriguing, artistic feature within the space. Struggling with ideas to provide a sense of expansion within your small dwelling? Then take a look at How to make the most out of your small kitchen for some inspiration! What do you think of the mirrored panels in this small apartment? Do they make a difference to your perception of the space? Tell us below!